Our party of six stopped in at Corleone's on Friday night. It was our first time visiting this quaint little trattoria in downtown Savannah. As you round the corner of Broughton Street onto MLK Boulevard, the aroma of garlic assaults the senses, leaving one quite weak in the knees before even making it through the door. The wine-red facade and striped awning beckons passersby to peek in the large, bottle-lined windows. The cozy interior exudes a friendly, neighborhood vibe. I can picture myself becoming a regular. They'll shout my name as I enter, just like Norm on Cheers and I'll politely say, My usual table please, dahhling. Perusing the extensive menu, I was torn between two lovers...veal piccata: white wine, lemon, garlic, capers, spinach over potato gratin OR, the herb encrusted salmon: pan seared and served over linguine with olives, capers and tomatoes. These menu descriptions aided my indecisiveness. One of my companions chose the veal, so I decided to bravely go with the salmon. I'll let you in on a little secret... even though I enjoyed the pasta, I was a bit disappointed with the fish. The menu says, herb encrusted, but doesn't mention a breaded exterior. The salmon was fresh. I would allow it to shine rather than hide under a bushel... of crumbs. The veal was amazingly light. I should have stuck with my first instinct. Ms. Smartiepants, who did order it, thought the piccata a bit lemony on it's own, but not me. I'm a huge fan of anything citrus. We agreed that the potatoes gratin cut the sauce's tartness and gave the dish a velvety finish. Our other lady friend ordered the eggplant parmesan. The eggplant was lightly breaded and fried, served over linguine, then topped with marinara and mozzarella. She enjoyed her choice immensely, but thought the use of marinara excessive. The solution for next time? Ask for a light hand on the sauce. 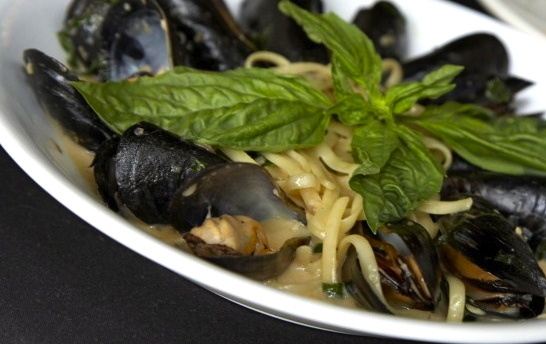 My husband went for Prince Edward Island mussels simmered in white wine and garlic over linguine (AMAZING,) and another spouse ordered shrimp fra diavolo sauteed with whole cherry tomatoes in spicy marinara served over linguine. I'm surmising that the shrimp was good, as he quickly joined the Clean Plate Club. 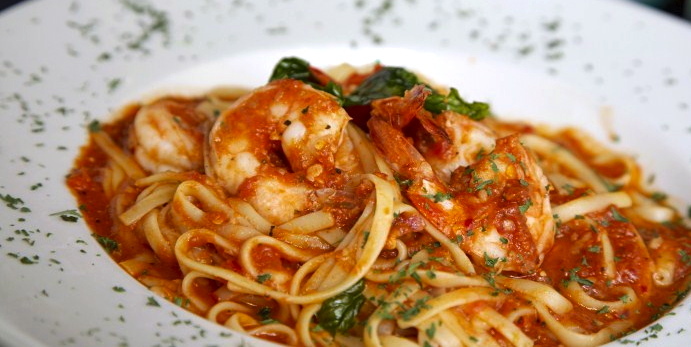 The four who had linguine all agreed on its perfect texture and freshness. Husband Number Three ordered a dramatically presented kabob, brought to the table on a high wooden stand, meat swaying over the plate like a crazy-big cocoon dangling from a branch. As our server set it on the table, oohs and aahs intermingled with the sounds of tinkling glasses and chatty diners. 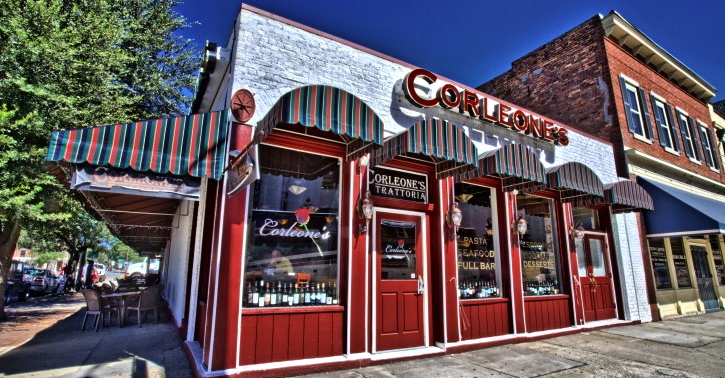 Corleone's menu offers your choice of filet, shrimp, veggies or a combo. The kabobs are served with Israeli couscous, spanikopita and salad. Finally, here is a tip on saving a bit of hard-earned moolah on your evening out. When I called to make reservations, I inquired about the specials, including wine specials for the night. 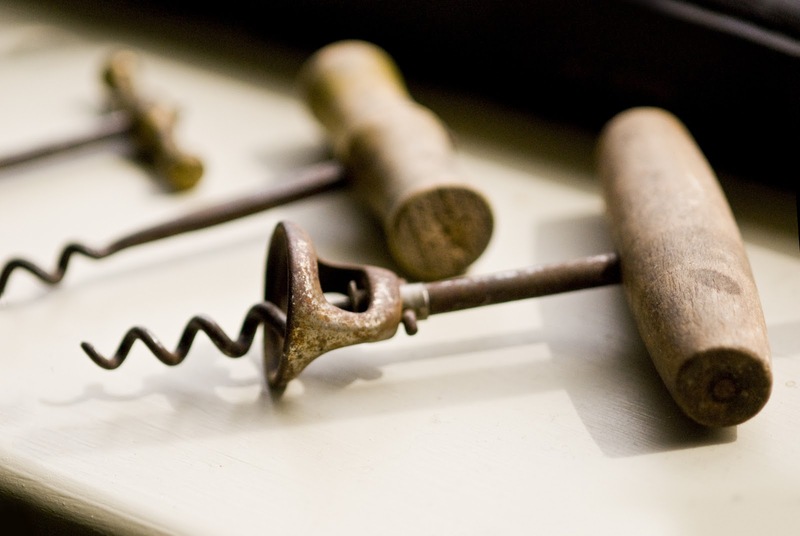 The host mentioned a corking fee. This means you are allowed to bring your favorite wine with you. The restaurant charges $10 per opened bottle, no matter the size. They open and pour for you and loan you glasses to drink it out of. Isn't that nice? Corleone's wine menu is extensive. The price for a bottle begins at $30. Since we split the corking fee, we saved money for dessert and coffee.